Island Grown Food for Island Folks. Committed to helping Vancouver Island have its own sustainable food source. Offering the consumer an alternative to commercialized and industrialized food. *Free Delivery to Langford and Victoria to our two rendezvous spots. Join our mailing list to hear about when they will be available. We are taking orders for sides of Beef. Minimum order is 1/4 cow. Free Range, Island raised and Pasture Raised. No Hormones. No Antibiotics. No steroids. Next Free Delivery date to Victoria and Langford area is basically ongoing because we go down at least once a week and can arrange to meet you near the TCH. Farm Pick-up Customers, just send in your order and we should have it available for PU within 2 days. 3. Gluten Free Turkey sausage (3 flavours) from our free range turkeys. 4. Regular TURKEY Sausage ( 3 flavours) from our free range turkeys. 5. Honey – Raw, pure and unpasteurized. $11.00 / jar (500 ml) 2 varieties. Visit our other website for our ‘Honey Bees and Supplies’. Prices and Products. All Fresh Products need to be pre-ordered using our order forms. 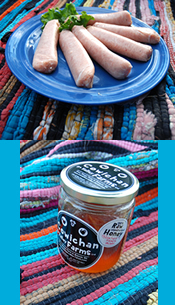 Frozen products such as sausage and honey can be picked up from the farm any time but by appointment. 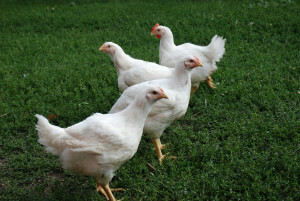 For Fresh Chicken and Turkey we will have a specific pick-up day when all customers will either come to the farm or meet us at one of the two rendezvous spots in Langford and Victoria. FREE DELIVERY to Victoria and Langford to those two spots. For chicken, the Langford/Victoria pick-up times are usually before noon on a weekday. For Turkey at Thanksgiving and Christmas the pick-up time at the rendezvous spots is generally early evening when most people are off of work. We do not have a walk-in freezer so we can not hold orders for people, hence it is important to pick-up your order on the allotted day. CHICKEN: The birds will be whole and individually bagged. There are 5-7 in a box, depending on how many fit. For Beef – please use the order form and Jim will call you to discuss the delivery. 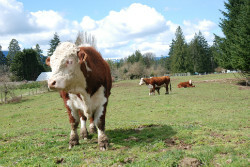 Cowichan customers come to the farm and we deliver for free to Victoria and Langford customers. The beef will be frozen and the cuts will be individually wrapped and in boxes. Join the email list to hear about the dates of when they are available, or email us. Island Grown Food for Island Folks. Committed to helping Vancouver Island have its own sustainable food source. Offering the consumer an alternative to commercialized and industrialized food. 2018 All Rights Reserved, Cowichan Valley Farms Ltd.